The loose timeline also gives Dara Khosrowshahi an opportunity to resolve many of the controversies facing the company. Uber could go public as soon as 18 months from now. 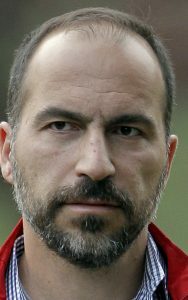 That was the news delivered to Uber’s 16,000-person workforce today by the embattled transportation company’s new chief executive, outgoing Expedia CEO Dara Khosrowshahi, according to an employee who attended the meeting. Khosrowshahi wasn’t definitive, the person said. In a meeting that was broadcast from San Francisco across the world, Khosrowshahi said the 8-year-old company could go public in a timeline of 18 to 36 months, but he would have to see. In addressing the issue at his first all-hands meeting, Khosrowshahi appeared to be trying to allay one of the biggest concerns not only for investors but also for employees. With a $68 billion valuation by private investors, Uber is the most valuable startup Silicon Valley has produced over the last decade, but funders have grown frustrated by the lack of a timeline for getting their payouts. Employees have also felt pent up, as many are compensated with options in the company. The loose timeline also gives Uber’s incoming leader an opportunity to resolve many of the controversies facing the company. That includes litigation with Google in a major case in which Uber is accused of stealing trade secrets from Google’s self-driving car program, as well as two pending federal investigations. On Tuesday, the company confirmed that the Department of Justice is probing whether executives broke U.S. laws prohibiting bribery of officials in foreign countries. Uber is cooperating with the investigation, a spokesman Matt Kallman said. Under Uber’s previous hard-charging chief executive, Travis Kalanick, Uber expanded to 77 countries in just eight years and built up a reputation for rule-breaking and for a “bro” culture that has been hostile to women and underrepresented minorities.